January 28, 2019, Hammonds Plains, Nova Scotia… Halifax District RCMP is investigating an arson that occurred on Blue Forest Lane in Hammonds Plains. At 5:20 a.m. yesterday, RCMP and Halifax Fire responded to the scene of a vehicle that was on fire. The investigation determined the fire to be suspicious in nature and was started by an incendiary device. The vehicle, a 2014 grey Acura TL, was stolen from the Mulgrave park area of Halifax. No one was injured as a result of the fire and the investigation is ongoing. Anyone with information on the arson is asked to contact Halifax District RCMP at 902-490-5020. Should you wish to remain anonymous, call Nova Scotia Crime Stoppers toll free at 1-800-222-TIPS (8477), submit a secure web tip at www.crimestoppers.ns.ca, or use the P3 Tips App. Police are investigating a robbery that occurred at a bank in Dartmouth this morning. At approximately 10:30 a.m. officers were called to a robbery that had just occurred at the Bank of Montreal located at 254 Baker Drive in Dartmouth. The man entered the location, indicated to staff that he was there to rob the bank, and demanded money. The man left the bank with an undisclosed amount of cash and fled the area. Investigators are asking anyone who has information on this incident or the identity of the man to call police at 902-490-5020. Anonymous tips can be sent to Crime Stoppers by calling toll-free 1-800-222-TIPS (8477), submitting a secure web tip at www.crimestoppers.ns.ca or using the P3 Tips App. At 12:56 a.m., 17 January, Halifax Regional Police responded to a robbery that had just occurred at the Ultramar gas station 2816 Gottingen Street, Halifax. Staff reported a male wearing a mask entered the store demanding cigarettes. The suspect left on foot with an undisclosed amount of cigarettes in an unknown direction of travel. No one was injured, no weapons were observed. Patrol officers searched the area, but have not located the suspect. The suspect is described as: White male, 50’s, 5’8”, thin build, brown hair, blue eyes, beard brown and gray. Wearing: Black mask, green jacket, black sweat pants. Police are asking anyone with information about this incident to call police at 902-490-5020. Anonymous tips can be sent to Crime Stoppers by calling toll-free 1-800-222-TIPS (8477), submitting a secure web tip at www.crimestoppers.ns.ca or by using the P3 Tips app. Police are asking for the public’s assistance in identifying the driver of a vehicle involved in a hit and run collision that occurred yesterday in Halifax. Police responded to a report of a pedestrian/motor vehicle collision that occurred at approximately 8:30 p.m. at the corner of Jubilee Road and Oxford Street in Halifax. A vehicle turning right onto the east bound lane of Oxford Street struck a 20-year-old male pedestrian who was attempting to cross Jubilee Road in a marked crosswalk. There were no reported injuries. The driver of the vehicle stopped briefly, and then left the area, headed east on Oxford Street. The vehicle is described as an older model black SUV with a Nova Scotia license plate. The female driver was the sole occupant of the vehicle. Police are asking the driver of the SUV, or anyone who was in the area at the time and witnessed the collision, to contact police. January 16, 2019, Hammonds Plains, Nova Scotia… Halifax District is investigating a string of recent thefts that occurred within an hour of each other in the Hammonds Plains and Tantallon areas. 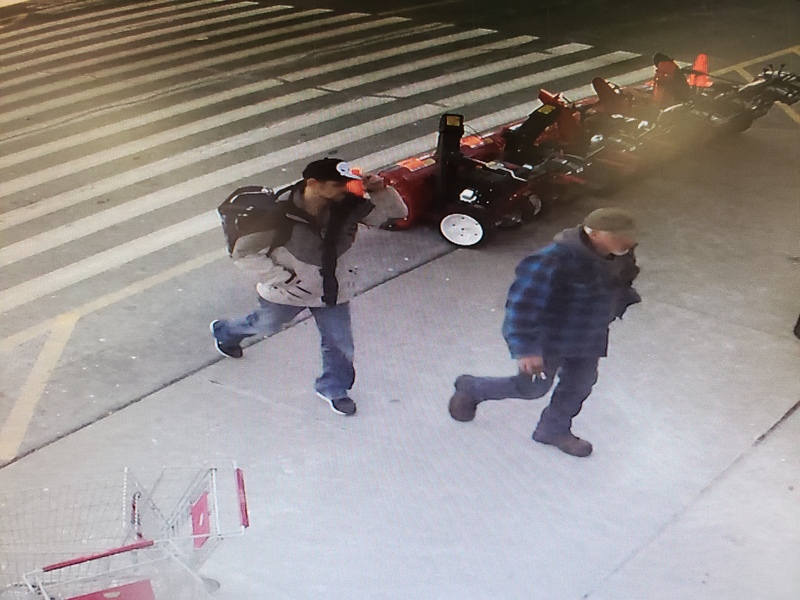 At approximately 1 p.m. on January 13, a man entered a business in Hammonds Plains with a blue cooler bag and was seen placing items in the bag. When confronted by security, he returned some of the items but left with unpaid items. Shortly after, the suspect went into a nearby pharmacy and stole four decorative rings. 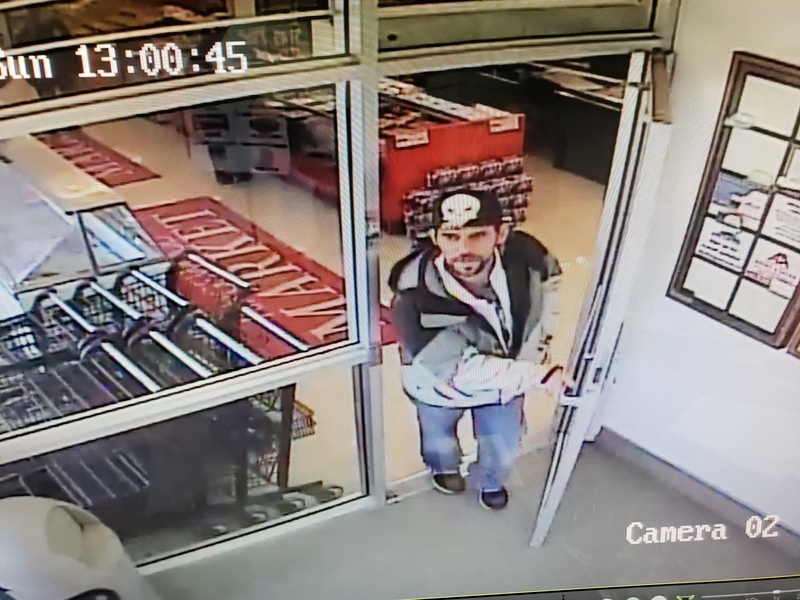 He then entered a business in Tantallon with a second suspect and placed a pair of orange Timberland sneakers in a cooler bag before leaving. It was later determined that two pairs of dark colored Nike sneakers (size 11 and 10.5) were also stolen. The suspects were seen leaving the Tantallon business in an older model Chrysler Intrepid, red/maroon in color. One of the suspects was wearing a black, beige and white winter coat, blue jeans, black and white sneakers and a black hat. The second suspect was wearing a ball cap, a blue and black jacket and jeans. Anyone with information about these crimes is asked to contact Halifax District RCMP at (902) 490-5020. Should you wish to remain anonymous, call Nova Scotia Crime Stoppers toll free at 1-800-222-TIPS (8477), submit a secure web tip at www.crimestoppers.ns.ca, or use the P3 Tips App. On January 15th, 2019 at 1:55p.m., Halifax Regional Police responded to the intersection of Sackville St. and Queen St. in Halifax regarding an adult male who had been struck by a car. The adult male who was not seriously injured had been crossing Queen St. was struck by a grey Kia that fled the area. The Kia was last seen South bound on Queen St.. The Kia driver was described as a male with dark hair. Police are asking anyone with information about these incidents to call police at 902-490-5020. Anonymous tips can be sent to Crime Stoppers by calling toll-free 1-800-222-TIPS (8477), submitting a secure web tip at www.crimestoppers.ns.ca or by using the P3 Tips app. Police file 19-7517 refers. 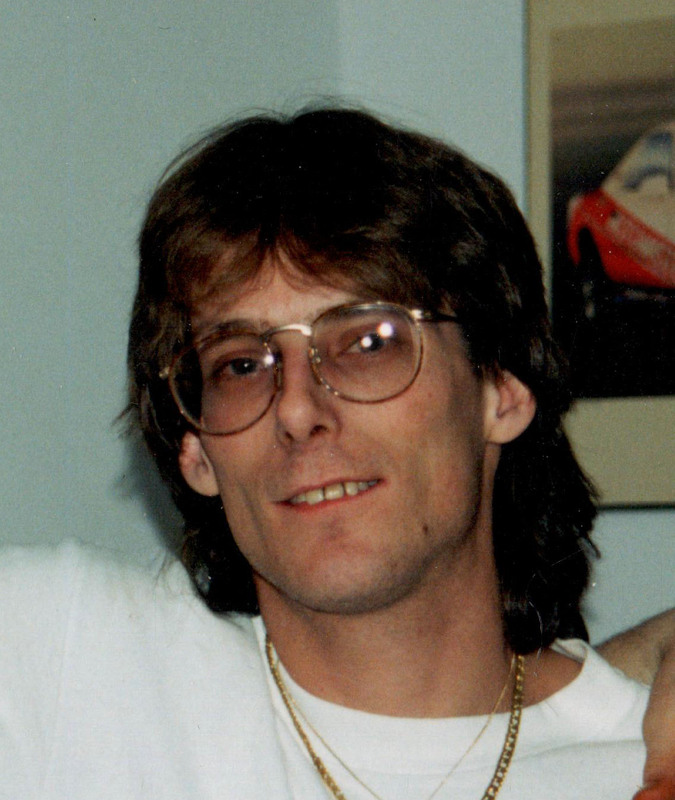 January 15, 2019, Cole Harbour, Nova Scotia…Halifax District RCMP is investigating an incident that occurred January 13 on Thomas St. in Cole Harbour. Just after 10 p.m., a homeowner heard the sound of a car door shut. When he got up to look outside, he saw a male wearing a hood throw a hammer through his bedroom window. The suspect then fled off in a dark 4-door hatchback vehicle. Anyone with information about this incident is asked to contact Halifax District RCMP at 902-490-5020. Should you wish to remain anonymous, call Nova Scotia Crime Stoppers toll free at 1-800-222-TIPS (8477), submit a secure web tip at www.crimestoppers.ns.ca, or use the P3 Tips App. Halifax Regional Police is investigating a street level robbery that occurred last night January 14 in Halifax. At 6:40 pm members responded to the Spring Garden Road McDonalds to a report of a street level robbery. A 40 year old female reported having a verbal dispute with 4-5 youths while inside the McDonalds restaurant. Once outside the restaurant, the victim reports being assaulted by at least 3 of the female suspects. The victim reports being spit on and punched and falling to the ground. The suspects stole personal items from the victims purse. The victim was uninjured and did not seek medical attention. The suspects were observed fleeing westbound on Spring Garden Road towards South Park Street. 1) White female under 18 years of age, approximately 5’2” in height, average build, facial piercing, wearing a black coat with a hood. 2) Black female under18 years of age, approximately 5’6” in height heavy set. 3) Black female, lighter complexion, approximately 5’1” in height, smaller build, wearing a red coat. Anyone with information about this incident or the identity of the suspects is asked to call police at 902-490-5016. Anonymous tips can be sent to Crime Stoppers by calling toll-free 1-800-222-TIPS (8477), submitting a secure web tip at www.crimestoppers.ns.ca or using the P3 Tips App. 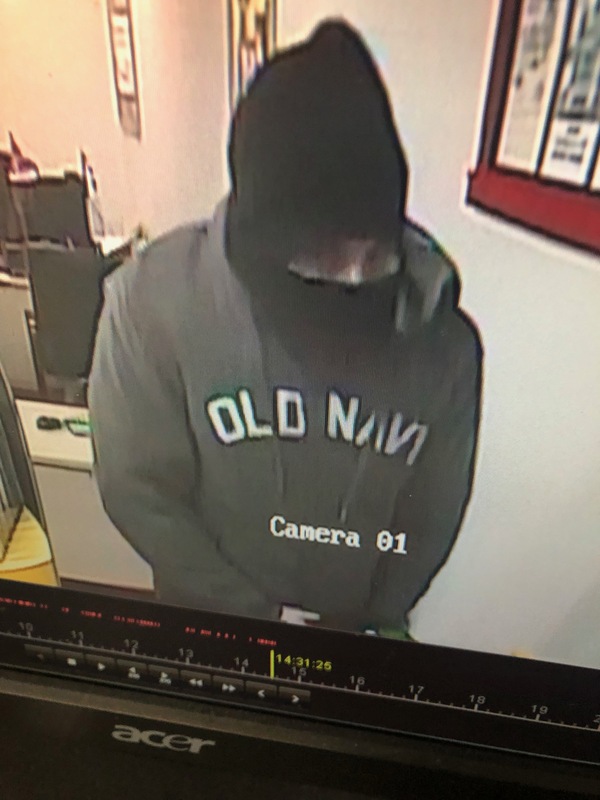 Police are asking for the public’s assistance in identifying the man believed responsible for two robberies on the same day that occurred in Halifax. At approximately 4:40 p.m. on December 17 police were called to a robbery that had just occurred at Money Direct located at 6021 Young Street in Halifax. The suspect came in to the store carrying a reusable shopping bag and attempted to access the employee only section of the business. He exited the store when he was approached by store employee and left the area on foot. Officers checked the area for the suspect but he was not located. At approximately 5:30 p.m. police were called to a robbery that had just occurred at the Irving Gas Station located at 5450 Inglis Street in Halifax. The suspect came into the store armed with a hand gun and demanded money. The store clerk provided an undisclosed amount of money to the suspect who then fled the area on foot. Officers searched the area but were unable to locate the suspect. Investigators believe it is the same suspect responsible for both of the incidents. He is described as a white man in his forties, husky build, approximately 220-280 lbs and 5’6-5’8 tall. He was wearing a gray sweater with “Old Navy” across the chest, dark jeans and a dark balaclava. Anyone who has information on this incident or the identity of the man is asked to call police at 902-490-5020. Anonymous tips can be sent to Crime Stoppers by calling toll-free 1-800-222-TIPS (8477), submitting a secure web tip at www.crimestoppers.ns.ca or using the P3 Tips App.